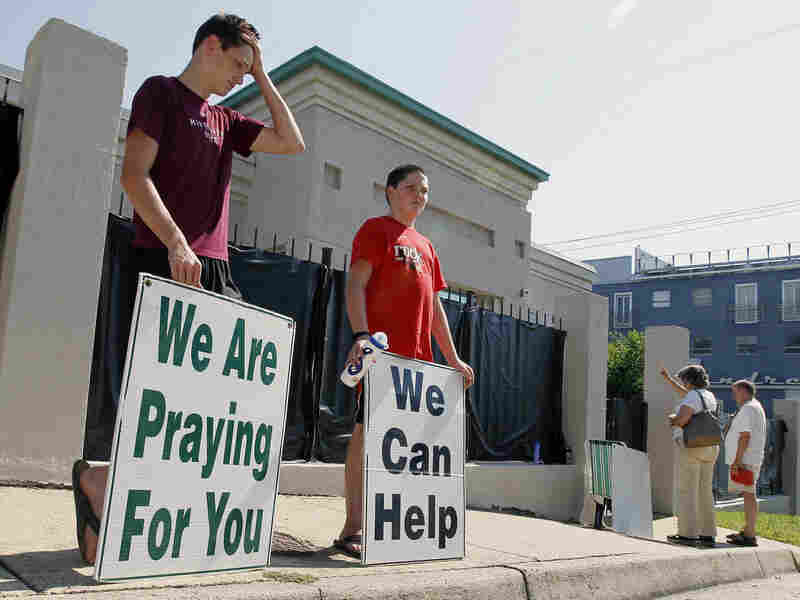 Only Abortion Clinic In Mississippi Fights Law To Stay Open Mississippi's only clinic that performs abortions is facing possible closure. A new state law requires doctors to have admitting privileges at local hospitals by July 1. But doctors at the Jackson Women's Health Organization have not yet been accepted. The clinic is now suing to stop the law, arguing it amounts to an unconstitutional ban on abortions. Abortion opponents demonstrate outside Mississippi's only abortion clinic in Jackson. A new Mississippi law requires doctors who perform abortions in the state to be board-certified OB-GYNs. They also must have privileges to admit patients at a local hospital. The law is regulatory in nature, but at a bill-signing ceremony in April, Mississippi Lt. Gov. Tate Reeves was clear about the intent. "We have an opportunity today with the signing of this bill to end abortion in Mississippi," he said. Now with the law set to go into effect on July 1, the Jackson Women's Health Organization — Mississippi's only clinic that performs abortions — is asking a federal judge to block enforcement of the law, arguing it unconstitutionally bans abortion in the state by imposing medically unjustified requirements. If the law stands, Mississippi would become the first state without abortion services. This is the canary in the mine. "This is the canary in the mine," says Diane Derzis, president of the clinic in Jackson, Miss. She says the fight in Mississippi reflects a national trend of states imposing ever tighter restrictions on abortion. "We're clearly losing," Derzis says. "These are all laws that they have passed through the years to try to close this facility down." According to Derzis, all three of the clinic's doctors are board-certified OB-GYNs, but only one has hospital privileges. The other two have applied at seven area hospitals but haven't heard back. She says the clinic is trying to comply. "We've been trying to jump through this hoop," she says. "We've just not had enough time." Republican State Rep. Sam Mims says the clinic has had more than 70 days to come into compliance. If this legislation causes this abortion facility to close, then I believe it is a good thing for Mississippi. "We believe, and I believe strongly, that if a person is going to receive an abortion, that if something goes wrong, we want that physician to be able to follow that patient to a local hospital," says Mims, who sponsored the legislation. He says the state has a right to set rules for medical facilities, but at the same time, he acknowledges the broader implications. "If this legislation causes this abortion facility to close," Mims says, "then I believe it is a good thing for Mississippi." Anti-abortion activists who pushed for the bill share Mims' sentiments about the clinic. "Would we like to see this clinic close? Absolutely," says Terri Herring, president of the Mississippi-based Pro Life America Network. The only way that unborn babies will be safe is when abortion is no longer available, she says. Abortion-rights groups are hoping a federal judge will step in and stop the law from taking effect. Michelle Movahed, staff attorney at the Center for Reproductive Rights, says the law is motivated by the unconstitutional purpose of trying to ban abortion in Mississippi. "The Supreme Court has been quite clear that [banning abortion is] absolutely unacceptable," Movahed says. Barring a federal judge's intervention, a state health inspector is set to check Monday whether the doctors are in compliance with the new law. If not, Mississippi's only abortion clinic will be shut down.